Microsoft is working to restore the downloadable content for original Xbox games, saying that its early removal from Xbox Live was a mistake. 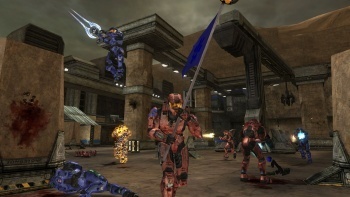 In response to the news that Xbox Live support for the original Xbox console and games would be drawn to a close in April, Bungie issued an open invitation to gamers for "one final farewell" to Halo 2, which remains a popular online shooter despite being more than five years old. Bit of a snag, however: In order to play online, gamers must have all the Halo 2 DLC, but Microsoft had already removed all that content. If you didn't happen to have it installed on your system, you weren't going to be able to take part. But it's starting to look like there may be good news on the horizon: Microsoft has acknowledged that it jumped the gun and that pulling the DLC so quickly was actually an error. "We are aware that Xbox v1 users are currently unable to access downloadable content via Xbox LIVE, both for the original console and Xbox Originals on Xbox 360," a company rep told Joystiq. "The team is actively working on resolving this issue so that the Xbox v1 community can continue downloading content until April 15." It's great news, not just for Halo fans but for everyone else who happens to have a favorite classic Xbox game too. Halo 2 is the big one but all the removed DLC is expected to be brought back, giving gamers one last shot at extra content for their old-school game of choice. No time frame for the restoration was given, but I would expect things to happen fairly quickly, so keep your eyes open and feel free to let us know when it happens. UPDATE: Major Nelson reports, via Twitter, that DLC for original Xbox games is back online. Go get it!